The Pro8530HDL is the perfect solution for large venue Pro AV projection requirements, thanks to a centred lens, sealed engine and multiple adjustment features like vertical lens shift, 1.6x optical zoom, horizontal & vertical keystone, plus 4-corner adjustment. 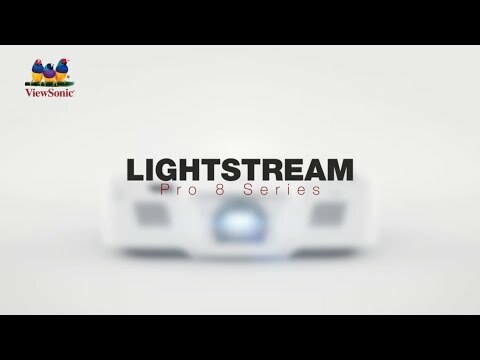 Utilising a unique "Flex-In" (Flexible Installation) design, the Pro8530HDL integrates an intuitive form with high flexibility and an easy installation process, making it the ideal installation projector. Equipped with 5,200 ANSI Lumens and Full HD resolution, the Pro8530HDL is powered by SuperColor™ and SonicExpert® to provide a professional audiovisual performance. It boasts a bilateral opening top cover, 4x HDMI (1 of which is MHL) and an intuitive PortAll® compartment to accommodate optinal HDBT solutions (an affordable way of transferring High Definition audio and video over long distance), wireless dongles, or PC stick integration for versatile application. ViewSonic®’s "Flex-In" design provides flexible installation that brings easy adjustment and maintenance. The tool-free and simple top cover design provides users ample room to adjust or change a dongle or lamp conveniently, making ceiling mounted applications easier to manage. ViewSonic’s exclusive PortAll® feature is a hidden compartment with an integrated and secure MHL/HDMI port that lets you discretely stream multimedia content from optional solutions including HDBT dongles, wireless dongles, PC sticks etc. In addition, the built-in Micro USB cable provides power to HDMI dongles for charging without a power source. HDBT technology is a cost-effective solution to transmit uncompressed ultra-HD audio & video, infrared controls, and power-for-dongles by a Cat.5e/6/7 LAN cable up to 70 meters that is better than HDMI performance. Based on HDBT technology, the ViewSonic® HDBT dongle fits into the PortAll®, boasting its stable transmission over longer distance, even carrying 4K signals up to 35 meters*, by a Cat.5e/6/7 Lan cable for HDMI-alternative extended installation. Power cables can easily become loose over time and can be a hassle to plug back in when the projector is mounted on the ceiling. The power cable lock helps to keep the cable secure, with an easy detach mechanism, so cords will not accidently become unplugged. Horizontal and vertical Keystone correction, plus auto vertical Keystone eliminates crooked and distorted images for a perfectly proportioned picture every time. The automatic vertical keystone (and 4-corner adjustment) also improves usability and makes setup and image positioning more convenient. ViewSonic®’s proprietary SuperColor™ Technology offers a wider colour range than conventional DLP® projectors, ensuring that users enjoy realistic and accurate colours. With an exclusive colour wheel design and dynamic lamp control capabilities, SuperColor™ Technology projects images with reliable and true-to-life colour performance, in both bright and dark environments, without sacrificing image quality. 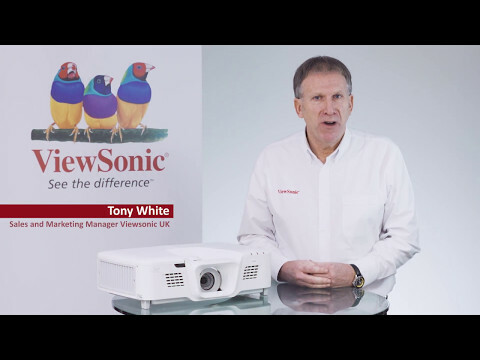 Following a groundbreaking proprietary speaker transducer and chamber redesign, ViewSonic projectors deliver full-range sound 20Hz – 20KHz. The 2 x 10W Cube speakers take pride in quality sound with best-fit Sound Response Curve, and high efficiency of transferring electric power to sound power.